We’ve just released new versions of the Syntaro Marketplace, as well as our Application Management and WimAsAService modules. Apart from improved usability (copying of package versions, integration of basescript from github etc.) in a lot of spaces, we’re very happy to share three major new features. Being a cloud born product opens up possibilities previously hard to achieve for small ISVs such as Syntaro. We’ve seen a growing interest and adoption of modern clients in Australia and also an innovative and thriving partner landscape ready to give their customers the support they need to be able to successfully execute such projects. Hence we are very happy to introduce our Australian infrastructure and declare it open for business. Go Aussie! The tenants are totally separate and institutions can count on their data remaining on Australian soil. All geographies have the same set of modules and offerings, but beware that WimAsAService and MAVIQ currently do reside in Europe if that’s an issue for you. Going forward, local modules, local partners and more is expected to come. If demands shows a need for it – we’re open for business everywhere where Microsoft Azure is! 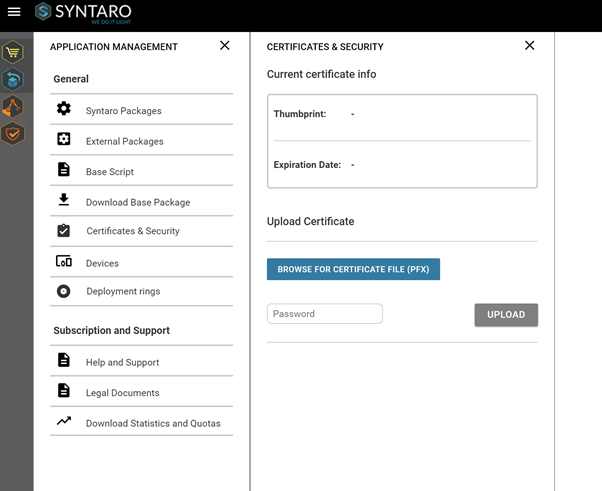 You now have the ability to upload your own certificate and add digital signatures to your Syntaro Powershell scripts. Currently the basepackage uses execution bypass to isolate the script from the running process. Powershell execution policies were never meant as security features and there are many ways to circumvent them so in that sense, we weren’t doing anything bad. We still want to ensure you have the highest security possible however and going forward we’d recommend the signing approach for that purpose. 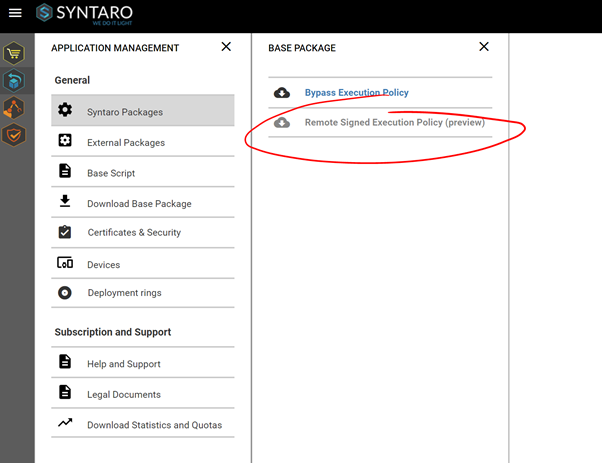 Be aware that you’d need to redeploy a new Syntaro Basepackage to all clients for this to work! Which is why we’ve released this as a “preview” feature for now. Even in the world of modern managed Windows clients, we sometimes rely on creating Windows Image files for deployment purposes, WimAsAService is getting more and more traction and has tremendous customer satisfaction! Hence we want to make it even more accessible to new customers as well as ease management for existing customers. We do so with a full Syntaro Marketplace integration. Going forward existing and new customers can manage their WimAsAService licenses entirely through the Syntaro Marketplace (existing customers will be migrated on request). In general this will increase the agility for WimAsAService customer as ordering new image types is now done with a few clicks, just like things should work in the modern world. Getting a trial is now also possible – as with every Syntaro product! If you haven’t tried it yet – do so! Get a trial, create a user and login. All with a few clicks! Visit our Syntaro Portal and check out the quick steps on how to set up your tenant. We have plenty of ideas for the future. For now expect a minor release in the October time frame. This will be a cleanup of the current UI and will add some important features behind the scenes to speed up our development, in terms of functionality you’ll have to wait and see what we have planned for you.